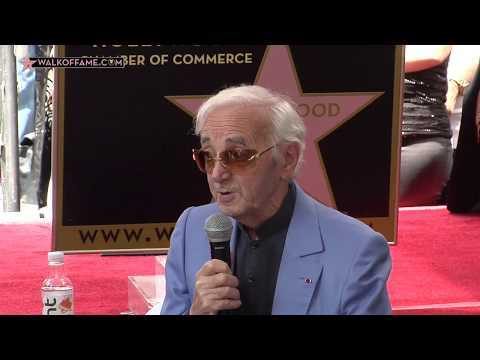 The Hollywood Chamber of Commerce proudly honored legendary entertainer Charles Aznavour with the 2,618th star on the Hollywood Walk of Fame today, Thursday, August 24, 2017 at 11:30 a.m. The star was dedicated in the category of Live Performance at 6225 Hollywood Boulevard next to the historic Pantages Theatre. Helping Emcee and Hollywood Chamber President/CEO Leron Gubler to unveil the star were guest speakers California State Senate President pro Tem Kevin de León and director Peter Bogdanovich. As an international recording artist and singing sensation, Charles Aznavour has sold more than 180 million records. With his career spanning more than 70 years, Aznavour has recorded 1,400 songs (1,300 of which he personally wrote) and has produced over 390 albums, all in multiple languages: French, English, Armenian, Spanish, Russian, German, and Italian. Many of his records have gone Platinum and Gold. Aznavour’s continued sold-out tours can only be matched in global scale by the numerous international honors he has received throughout his career. At 93 years young, “France’s Frank Sinatra” continues to write and perform, with his family and friends by his side. In 1986, in a nod to his acting career, Aznavour served as a member of the jury for the Cannes Film Festival. In 1996, Aznavour was inducted into the Songwriters Hall of Fame. In 1997, France, bestowed upon him the prestigious Officier de la Légion d’honneur (Officer of the Legion of Honor), an honor which recognizes extraordinary military and civil service. In 2004, Aznavour’s ethnic homeland, Armenia, named him a National Hero, the highest honor awarded in Armenia. In 2015, he was awarded by royal decree, Belgium’s Commander in the Order of the Crown. In addition to music, Aznavour is credited in over 90 films, including: The classic “Shoot the Piano player” directed by Francois Truffaut (1960) “Candy” (1968), with Marlon Brando, Ringo Starr, and Richard Burton; “The Tin Drum” (1979), which won the Academy Award® for Best Foreign Film; and the French-dubbed version of “Up”(2009), Disney’s feature film. Born in Paris on May 22, 1924 to survivors of the Armenian Genocide, Aznavour discovered his passion for performing arts early in his life. His father put together live shows at his local Parisian restaurant for friends. With such an early exposure, Aznavour and his sister, Aida, took up acting and singing together. At nine years old, Aznavour performed in his first play, “Emil and the Detectives.” This performance marked the beginning of Aznavour’s 84-year-and-counting career as a songwriter, actor, singer, and all-around global entertainer. After WWII, Aznavour partnered up with Pierre Roche, a “gifted pianist” by Aznavour’s word. Together, they formed a successful duo while on tour in Canada. During the late 1940s, Aznavour and Roche gave a truly grueling line of performances: 40 weeks’ worth of shows, with about 11 live performances per week. On this tour, Aznavour wrote his first song, J'ai Bu. In 1946, fate took a turn for the better when Aznavour met Édith Piaf, the famous French chanteuse. Piaf invited Aznavour to tour the United States as her manager and songwriter. This partnership worked well for both of them: Piaf entertained the audience with her voice, and he witnessed live performance at a level above his. In 1956, Aznavour began his solo career at the Olympia music hall in Paris with his first solo hit song, “Sur Ma Vie.” A few years later, in 1960, Aznavour performed in front of what he thought was a tough audience at the Alhambra music hall in Paris. One can only imagine his astonishment when, after coming out for hisfinal bow, he received a thunderous applause, which marked the beginning of his solo career as a singer. The 1970s and 1980s saw Aznavour’s at his peak in writing and performing songs. These two decades also saw two of his greatest hits and affirm his standing as a world-class entertainer. “Yesterday When I Was Young” (1970) is considered Aznavour’s most popular song in the United States. Across the pond, his most popular hit, “She” (1974), topped the charts for solos in the United Kingdom for four consecutive weeks. It went Platinum with over 1 million sales. From his humble beginnings in Paris, Aznavour has traveled the world, played the Carnegie Hall in New York; the Gibson Amphitheater in Los Angeles; Yerevan, Armenia; Montreal, Canada; London, UK; Brussels, Belgium; Tokyo, Japan; Dubai, India; Los Angeles and countless other U.S. cities and throughout the world. In October 2016, he performed at the Pantages Theater in Hollywood, his last stop on his 2016 North American tour. Aznavour has dedicated his efforts towards making a difference in the lives of other people. Among his charitable activities he used the proceeds from the hit song “Pour Toi Armenie” to aid victims of the 1988 earthquake in Armenia and continues his humanitarian projects through the Aznavour Foundation founded with his son Nicolas Aznavour in 2017. The goals of the Aznavour Foundation are to continue the development and implementation of educational, social and cultural programs. One of the main projects of the Aznavour Foundation will be to create an authentic, lively and interactive museum, retelling of Charles Aznavour’s life and achievements. Aznavour also serves as Armenia’s ambassador to Switzerland and to UNESCO in Paris. In addition, as a composer and performer of original content, Aznavour has campaigned strongly for anti-piracy laws and international copyright and intellectual property protections.